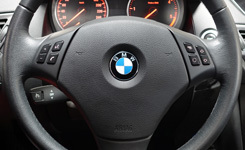 The series of 7 inch installation kits for the BMW platforms (without Navigation System) include all parts needed to install and make iLX-700 / INE-W987D work in the target vehicle. The parts for mechanical fitting are included. With the KIT-7BM3A, you can not only keep and improve the car's steering wheel remote control, maintain the parking sensor and warning sounds, you will also add a completely new experience when parking and operating the air condition. The KIT-7BM3A translates the parking sensor data to the Alpine iLX-700 / INE-W987D in a way that you get a visual representation of the parking sensors. When operating the air condition, heater or ventilation controls, a visual representation will be shown on the screen of the iLX-700 / INE-W987D. This feature is common in many vehicles, but not in BMWs in the application range of the KIT-7BM3A.